Your life has three topics. Believe me. I am going to convince you of that. When I am done, you will see yourself differently. I want you to recognize that as you live each day, your rhythms, your decisions, the flow of your day, all oscillate among three great topics, three great forces—even when you do not know it. 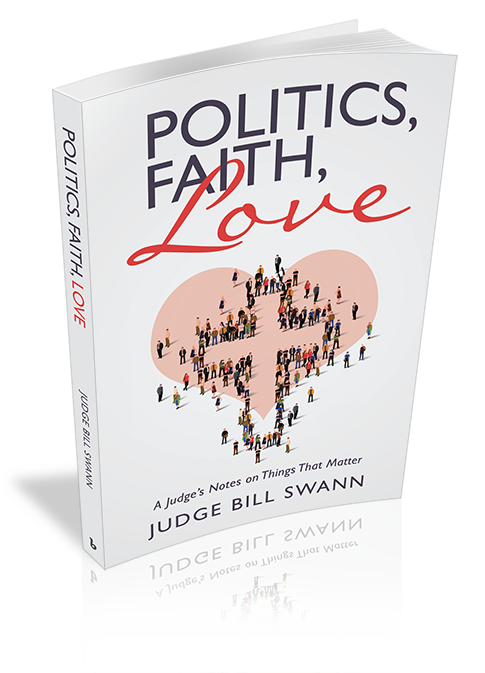 Even if you have not thought about it until now, you will come to agree that politics, faith, and love are the three forces of your life. It is going to be a fast ride. Enjoy! Swann muses about the transcendent pleasure of literature. He makes a stirring case for the youthful study of English and the lasting beauty of Shakespearean plays. His contemplative essays are written in an informal tone, with a perspective eclectically informed by a background both in law and letters. Swann (Five Proofs of Christianity, 2016) enjoys a “blessed” retirement after a career that included eight years as a lawyer and thirty-two as a judge. This is a serious book, but it is full of whimsy. A veteran trial-court judge writes about his faith life, which ought to be boring, right? Far from it. You are in for a joyous ride. 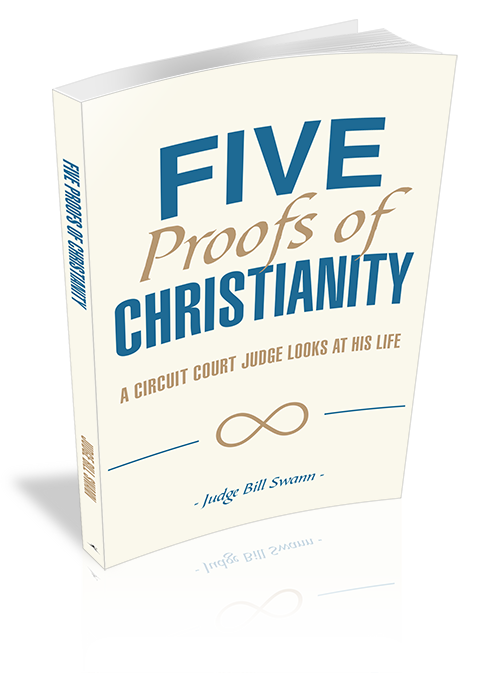 In Five Proofs of Christianity: A Circuit Court Judge Looks at His Life, Bill Swann lays out his five bases for faith in a small book: “I came to write it because I remembered the dismissal from the Episcopal church in Harvard Square, Christ Church: ‘And now may the peace of God which passeth all understanding keep your hearts and minds…’ And I wrote because I thought I dimly remembered the New Testament had various assurances of peace.” He continues, “I was a worrier. Most of the people who came before me in court were worriers. I knew that Christ had had things to say about worrying. Not to do it, the lilies of the field. All that. What, if anything, I wondered, was that about? Just blather? Just words? Or for real? Well, if the assurance of peace was truly there, and if it was in fact real, then it was indeed everything. It was the answer to all earthly woes real and imagined. So I set myself a challenge to figure out whether there was anything worth bothering about in Christianity.” In the book, Swann sets out in a gently argumentative fashion his five independent reasons to accept Christianity. “My faith life took a leap forward in 2013 when I joined a men’s Bible study group, a small community of believers who support and pray for each other. That coincided with concentrated work on the book. I am pleased to say that since the book came out, many people have contacted me with thanks for writing because it helped them.” Since retiring from the bench in 2014, Swann says that—being a workaholic—he is now working harder than ever, mediating family law cases and writing. This is my attempt to isolate the devices of narrative technique which any author can call upon to convey fantastic material to a rational public. Nora Roberts does not travel this route. She presents fantastic material with no apologies: “Get ready. This is a story about faeries today in Ireland.” Shakespeare does not hesitate to put the ghost of Hamlet‘s father on stage, or the three witches in Macbeth. Algernon Blackwood on the other hand will not assault us frontally. He introduces ambiguities. What exactly did happen to that hunting party in Canada? Was there really a wendigo? The most reliable observer, the sober Dr. Cathcart, does not know. The mind can play tricks, he says . . .
Washington Irving also waffles. What really took place with Ichabod Crane in “The Legend of Sleepy Hollow” ? No one knows. There are various opinions among the villagers. 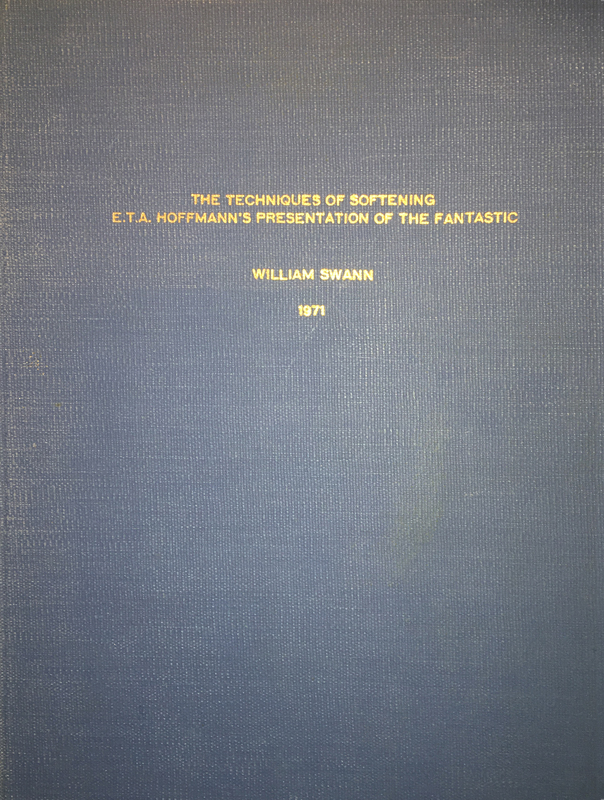 Hoffmann was a master of carefully presenting the fantastic. Since his devices operate to cushion the shock of confronting rationally inexplicable elements in fiction, I call them the techniques of softening. In my estimate, E.T.A. Hoffmann has six such devices, some more successful than others. My fascination with narrative technique began with Hoffmann. The obvious strength of this dissertation is the originality of its conceptual framework. 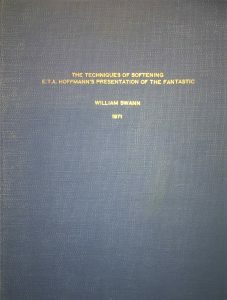 Swann succeeds in isolating and defining certain basic techniques which Hoffmann utilizes in his varied portrayals of the fantastic. Since this has not been accomplished by previous Hoffmann scholarship, Swann’s results are of considerable consequence. Apart from a predilection for numbers and columns, Swann is a sensitive, imaginative, and circumspect close reader . . . Particularly his searching and perceptive analyses of ambiguity in Die Bergwerke zu Falun and in Das öde Haus display an agile literary intelligence.